Grand spiral galaxies often seem to get all the glory, flaunting their young, bright, blue star clusters in beautiful, symmetric spiral arms. But small, irregular galaxies form stars too. In fact, as pictured here, dwarf galaxy NGC 1569 is apparently undergoing a burst of star forming activity, thought to have begun over 25 million years ago. The resulting turbulent environment is fed by supernova explosions as the cosmic detonations spew out material and trigger further star formation. Two massive star clusters - youthful counterparts to globular star clusters in our own spiral Milky Way galaxy - are seen left of center in the gorgeous Hubble Space Telescope image . 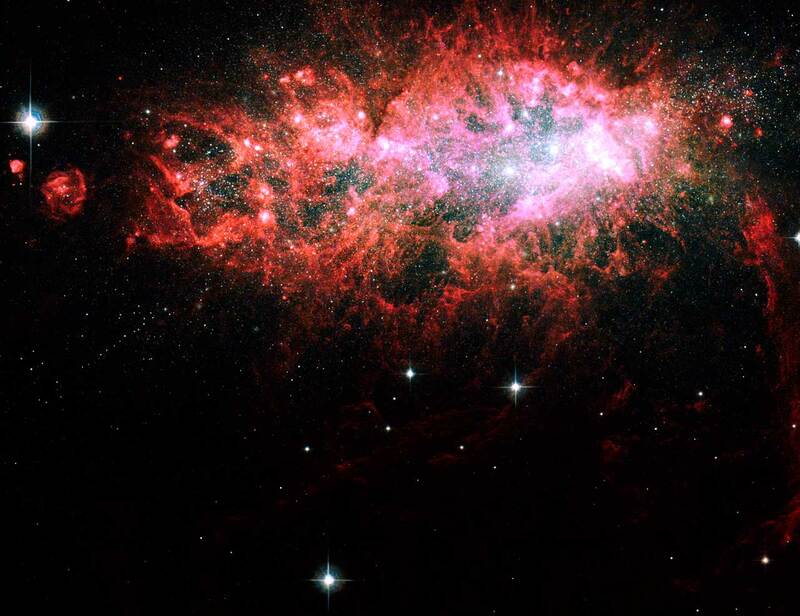 The above picture spans about 8,000 light-years across NGC 1569. A mere 11 million light-years distant, this relatively close starburst galaxy offers astronomers an excellent opportunity to study stellar populations in rapidly evolving galaxies. NGC 1569 lies in the long-necked constellation Camelopardalis.